1 to 2% of women under 40 are affected by premature ovarian failure (PDI). Sometimes called, erroneously, “early menopause”, this IOP actually covers multiple situations. Ovarian failure is an inevitable physiological process in women. This is called menopause, which occurs on average at age 51. This menopause is called early when it occurs before age 40. There is also talk of early ovarian failure (IOP). Early ovarian failure is clinically defined as amenorrhea (absence of menses) more than four months before the age of 40, associated with high FSH levels in at least two samples taken within a few weeks of each other. Early ovarian failure leads to infertility because without ovulation, there is no fertilization possible. However, some women with PDI may intermittently have eostrogen production and ovulate, and in 5 to 10% of cases, have a baby. As a reminder, in the girl, the stock of ovarian follicles is constituted in utero. Thus at birth, each ovary contains a “pool” of 1 to 2 million ovarian follicles. From puberty to menopause, at each cycle, a small portion of this stock matures during the follicular phase. A dominant follicle matures and ovulates, while other follicles die. At the same time, there is a normal phenomenon of apoptosis, or “programmed death,” of a certain part of the follicle pool. This phenomenon accelerates after 37 years and menopause occurs when the number of follicles is less than 1000.
abnormally fast depletion of the follicular stock. viral causes. Here again, research must continue on this possible viral track. But in more than 80% of cases, the IOP remains idiopathic: its cause remains unknown . 1% among women under 40. It is also known that young women with PDI have an increased risk of developing autoimmune adrenal insufficiency. various symptoms, related to the estrogen deficiency, can accompany the stopping of the rules: flushing, insomnia, fatigue, disorders of the mood. Difficulties to conceive can also be a motive for consaltation. The family history of IOP is the main risk factor. About 10% of the cases of IOP are indeed family. The family history of certain genetic abnormalities (premutations of the FMR1 gene in particular) is also risk factors. two doses of FSH at one month intervals with results greater than 20 IU / L.
Ultrasound is not a determining factor in the diagnosis of IOP. Ovarian biopsy is useless. Once the diagnosis is made, we will try to find the cause of the IOP with different elements: interrogation on the personal and family medical history, clinical examination, karyotype, etc. manage infertility if the patient wants to have a baby. Currently, there is no treatment to restore ovulation in women with PDI. 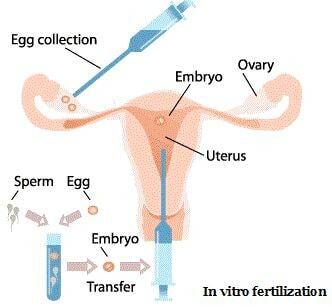 IVF with oocyte donation is therefore the only possible AMP treatment. With the exception of sampling and egg freezing prior to anti-cancer treatment in young women, no prevention exists against IOP. It is also impossible to predict the occurrence of an IOP because there is no predictive marker of its occurrence. However, it is important to consult when previously irregular cycles become irregular, in order to detect early ovarian failure as early as possible.